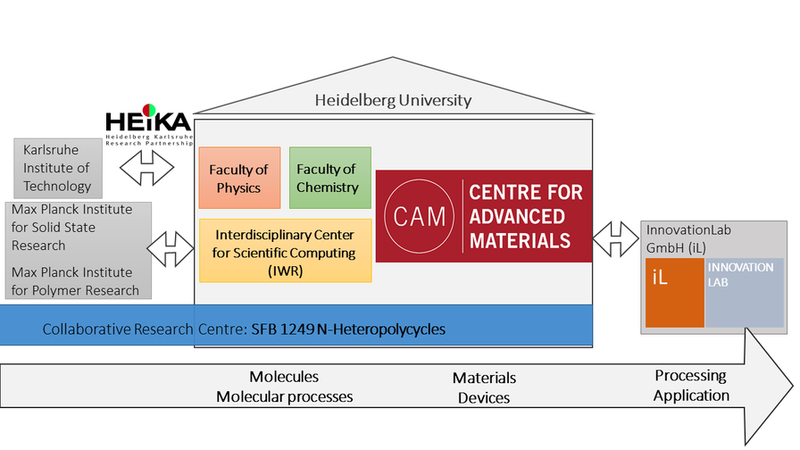 The Centre for Advanced Materials (CAM) is a central research institute (“Zentrale Wissenschaftliche Einrichtung”) of the Heidelberg University and dedicated to basic research in materials science with an initial focus on materials and devices for organic and printed electronics. CAM is not assigned to a specific faculty but reports directly to the President’s Office. The insitute is dedicated to revealing basic processes related to charge injection, charge transport, electron-hole pair generation and recombination in molecular and hybrid functional materials with the goal to correlate and to ultimately tune physical properties with and by molecular structure, morphology and processing. Hence, the research concept of CAM spans from synthesis of new organic materials their photophysical and morphological characterization in solution and thin films to device processing and characterization, guided and supported by computations and modelling. To fulfil this mission CAM provides state-of-the-art laboratories, a cleanroom for device fabrication, computational resources and a wide range of high-end equipment for material processing and characterization. CAM is embedded in the comprehensive research network of Field of Focus 2, including the collaborative research centre “N-Heteropolycycles” (SFB1249). It is also connected with the Karlsruhe Institute of Technology (KIT) via research bridges of the HEiKA partnership, including the new Cluster of Excellence 3D Matter Made to Order (3DMM2O) and the Innovation Lab GmbH (iL) for transfer. Integration of CAM within Heidelberg University and beyond. The official notification of the founding of CAM as well as the statutes can be found here: Mitteilungsblatt des Rektors Nr. 19/2011 (PDF).